Marc Jacobs's Le Marc Lip Crème in Je T'Aime is my first Marc Jacobs lip product. 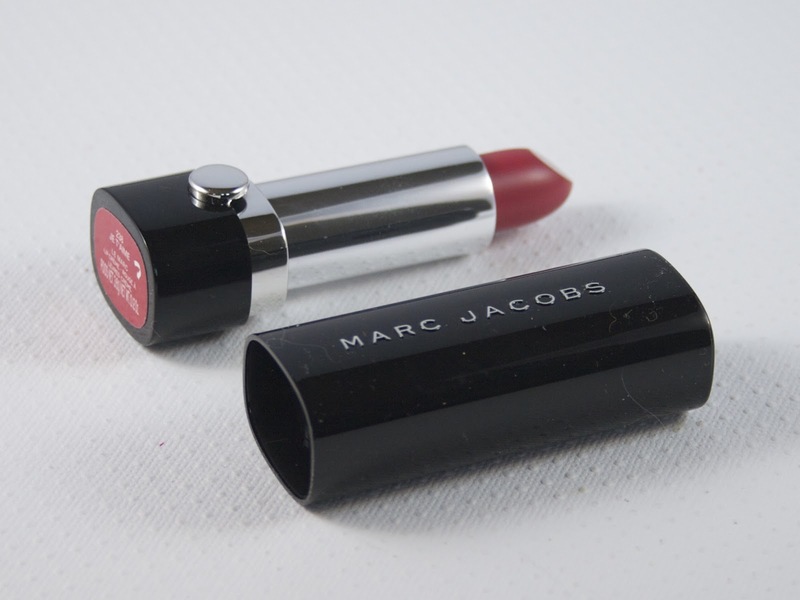 It is one of the new reformulated lipsticks Marc Jacobs released earlier this year. I had seen a few people talking about Je T'Aime, but it was this instagram from DontCallMeJesse (aka JemOrJerrica on Youtube) that made me put Je T'Aime into my Sephora.com cart and pull the trigger. 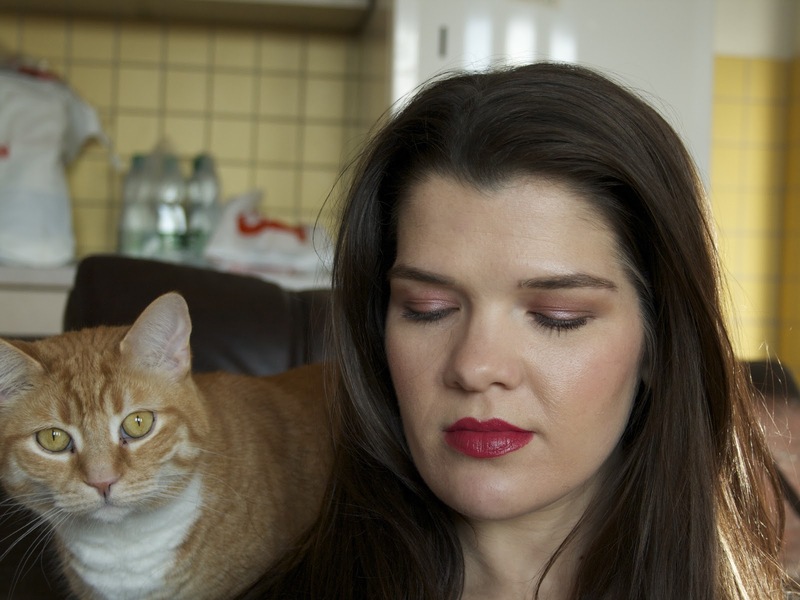 As a brief side note, that woman gives me more lipstick lemmings than anyone else on the planet. If you aren't following her yet, crawl out from under the rock you're living (I kid, I kid) and go follow her! Anyways, back to my main point, which was that I ordered Je T'Aime without having ever seen it in real life. On the Sephora website it is described as a 'rum raspberry' shade. Based on that description and how it looked in other swatches I saw on blogs/instagram/youtube/etc, I was counting on receiving a mid-toned, slightly warm raspberry shade. But as you can see in the picture above, it's more of a run-of-the-mill pinky red color on my lips. I had hoped to be able to report back that 'J'adore Je T'Aime! Ce rouge à lèvres est magnifique!' but I just don't love it. That's not to say that the color isn't nice, it is just different--and less unique--than I was expecting. I guess that is the price you pay when you don't swatch before you buy. But even despite my slight disappointment over the shade, I'm still happy I picked this up as the formula is stunning! Easily one of my new favorites. Je T'Aime doesn't require any lip liner (although I might experiment with one to see if I can mix up the color a bit). It has stellar lasting power (upwards of 6+ hours on me, including drinking countless cups of coffee and tea and having lunch each time I've worn it). It doesn't feather or sink into lip lines, either. 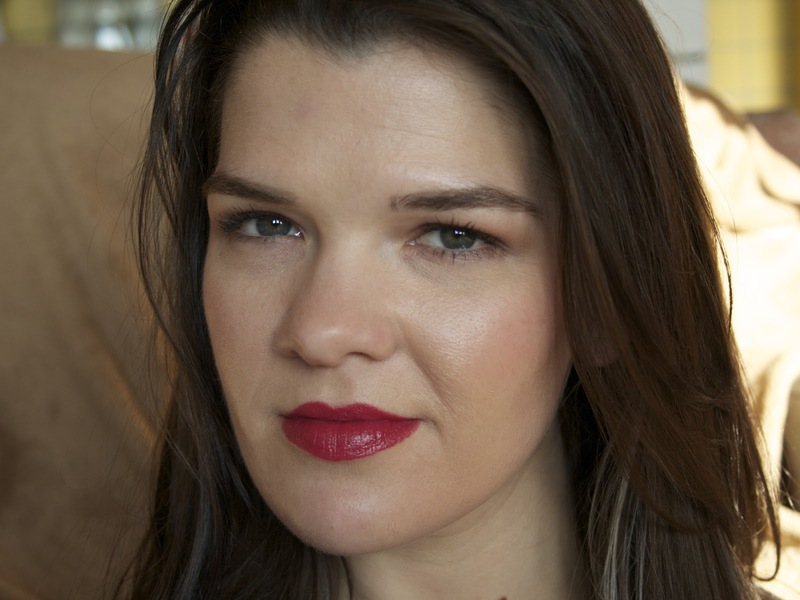 Upon initially application it does tug at the lips slightly, much like I find the NARS Audacious lipsticks do. 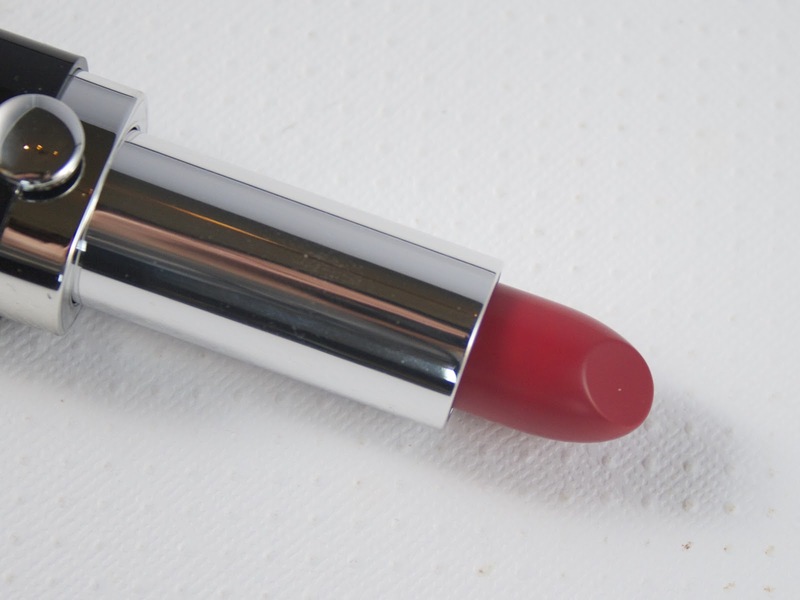 But on the lips it is supremely comfortable to wear—more comfortable than I find the Audacious lipsticks, for instance. I wouldn't go so far as to say that it actually moisturizes the lips, but in a way it feels like it does (if you get my drift). It has a satin finish, which I accentuated a bit in these photos by wearing my By Terry Baume de Rose underneath. Kitten photobomb! Millie was just as impressed with the Lip Crème formula as I was! I loved the formula of Je T'Aime so much that during the Sephora Chic Week sale, I ordered another shade from the Lip Crème range (Infamous, described as a soft peony). I'm hoping I like the shade of Infamous more than Je T'Aime. But I'm sure I'll even get a lot of wear out of Je T'Aime as soon as autumn rolls back in! Hashtag No Regrets. If you are in the market for a creamy/opaque/long-lasting/but not drying lipstick, I highly, highly recommend you check out the Marc Jacobs Lip Crèmes. Sabrina at TheBeautyLookBook has done arm and lip swatches of all 20 shades in the line, if you need some inspiration! The Marc Jacobs Le Marc Lip Crèmes are available for $30 at Sephora and MarcJacobsBeauty. Have you tried any of the Lip Crèmes yet? Let me know what your favorites are (or which ones you have your eye on) below. And don't forget to follow me on Bloglovin, Instagram, and Twitter!